Family pause Wesley Hathaway and co-director Barb Wise and Hathaway’s grandmother pause for a family photo prior to the show taking to the stage. Cast and Crew "The Lion who Lost His Roar" cast and crew. 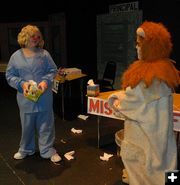 One sixth grader with two fifth graders and 13 fourth-grade students performed "The Lion Who Lost His Roar" at the Pinedale High School Auditorium for elementary and middle school students on Wednesday and Thursday afternoons with a public performance concluding the show’s run on Thursday night. The Pinedale Community Theatre and the Pinedale Fine Arts Council produced the children’s play with Barb Wise and Carmen Hittle at the helm as co-directors. Wesley Hathaway, Tori Mackenzie, Victoria Carter, Taylor Ruckman, William Stevens, McKenna Legerski, River Dauwen, Sophie Sinclair, Jace Buchanan, Sophie Haase, Clair Stough, Olivia Pape, Brittney Hill, Catie Hott, Shilo Thayne, Rose Oberreit, Sylvee McClure along with co-directors Barb Wise and Carmen Hittle. Hold still Portraying Cha Cha Cha, the lion, Wesley Hathaway tries to hold still while stage manager Megan Hill and co-director Barb Wise adjust his microphone headpiece before the show begins on Thursday afternoon. Props Crystal Updike created hot dogs and buns for the lunchroom props that also included fake fruit and empty milk cartons. Backstage entertainment A tiny portable DVD screen propped up on a chair provides entertainment for several of the cast members backstage before the show. Miss Sniffle Before the audience comes to the show, Tori Mackenzie playing Miss Sniffle, the school nurse, rehearses with Cha Cha Cha, played by Wesley Hathaway. Final instructions Final instructions The cast and crew take a seat on stage as they receive final instructions from co-director Barb Wise before the first show on Thursday. Great hair Trish Ziegler and Kelli Anderson twisted and curled and created beautiful hairdos for the cast members of the show. Lips ‘n’ cheeks Kim Buchanan applies lipstick to Clair Stough while Rose Oberreit looks on. Preshow play Cast members Tori Mackenzie, Rose Oberreit, Shilo Thayne and Sophie Haase tickle each other’s arms and find other ways to entertain themselves while waiting to take to the stage. 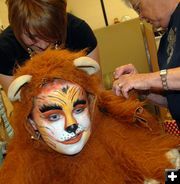 Readying the lion Wesley Hathaway gets prepped for the show as Carmen Hittle applies the colored streaks for his lion makeup. Looking to be free Playing students at Chestnut School, McKenna Legerski, River Dawen and Sophie Trosclair talk to Cha Cha Cha The Lion in his cage at the zoo, and eventually, let the lion loose to give him his freedom. Miss Noodle Cha Cha Cha is in search of his two hot dogs with mustard slightly wiped off after Miss Noodle, played by Taylor Ruckman, in the cafeteria has taken the uneaten food away. Miss Tickle Miss Tickle Cha Cha Cha learns from Miss Tickle the principal that, as a lion, he is entitled to two hot dogs for lunch and finally that the ultimate punishment means he must leave the school for one day. Mr. Trebble William Stevens, far right, plays Mr. Trebble, the music teacher, who shows up at the cafeteria to conduct a few notes from the students (left to right, Catie Hott, Brittney Hill, Rose Oberreit, Sylvee McClure and Shilo Thayne) while Cha Cha Cha checks out the school lunch fare of hot dogs with mustard. Safety Dwayne Jace Buchanan plays Dwayne, the first safety Cha Cha Cha encounters during his trip to Chestnut school. Safety Lucy Cha Cha Cha keeps running into safeties and getting citations for breaking the rules. Here safety Lucy, played by Clair Stough, cites Cha Cha Cha for running. Safety Rose Safety Rose, played by Sophie Haase is quick to give Cha Cha Cha another citation for breaking the rules at Chestnut School. Safety Alice Safety Alice Safety Alice, played by Olivia Pape, doesn’t want to ask any questions or give any citations, so Cha Cha Cah pushes her to give him a third citation in order to face "The Ultimate Punishment!" Home at last Cha Cha Cah gets a pass to run in order to return to his home at the zoo. ROAR Cha Cha Cha finally gets his roar back when he is safely home at the zoo in his cage. Special treats In celebration of the final show, co-director Carmen Hittle, along with help from co-director Barb Wise, made special decorated lion cookies for all the cast and crew members.